Besides being indispensable to modern investigations into the physical world, light polarization is a fundamental component of several revolutionary technological innovations in such diverse fields as telecommunications, pollution control, and medical diagnostics. Yet there is a conspicuous dearth of texts and professional references providing researchers and engineers with a unified, comprehensive treatment of basic light polarization theory and its applications to current microwave and optical technology. This book fills that gap in the literature. Fundamentals of Polarized Light serves equally well as an advanced text for physics and electrical engineering students and a professional reference for practicing engineers and researchers. It combines a rational, integrated presentation of the theory behind modern applications of light polarization with several demonstrations of current applications. 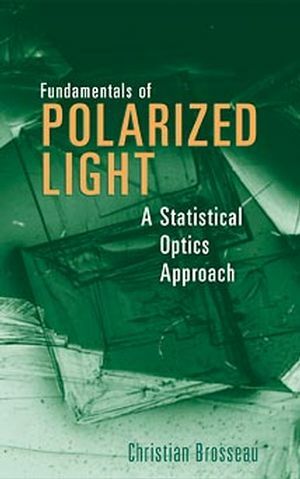 A key feature of the book is that the analysis of polarized light and its interaction with linear optical media is presented from a statistical point of view. CHRISTIAN BROSSEAU received a PhD degree in physics from Fourier University, Grenoble, France, in 1989. He was a postdoctoral Research Fellow at Harvard from 1989 to 1990 and then joined Fourier University as an associate research physicist. In 1997, he became a physics professor in the Department of Physics at the University of Brest, France. His primary research interests include the physics of heterogeneous materials and theoretical optics. HISTORIAL SURVEY OF UNDERSTANDING OF POLARIZED LIGHT. First Period: Early Ideas and Observations-from Bartholinus to Stokes. Second Period: The Electromagnetic Nature of Light. Third Period: The Coherence and Quantum Properties of Light. PRELIMINARIES TO A CLASSICAL RADIATION FIELD THEORY. The Basic Differential Equations and Boundary Conditions. POLARIZATION AND THE RADIATION FIELD. Geometric Representations of Partially Polarized Light. Statistics of the Radiation Field. Entropy of the Radiation Field. INTERACTION OF RADIATION WITH LINEAR MEDIA. Jones and Mueller Polarization Transfer Matrix Methods. Polarization Effects at Dielectric Interfaces. Polarized Light and Symmetry Transformations. Electromagnetic Propagation in Linear Anisotropic Media. Measurement of Jones and Mueller Polarization Matrices.